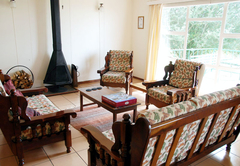 Little Troutbeck is a property providing self catering in Belfast for tourists visiting the Highlands Meander region. 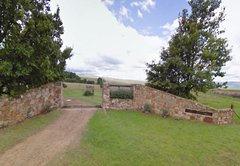 Boasting a magnificent view over the Elands River Valley and offering self catering accommodation, Little Troutbeck is a 209ha working farm set 1900m above sea level in the mist belt of Belfast, 19km from Dullstroom. There are eleven dams with a stream running through them. All water is sourced from springs on the farm (28 in a good year) and the water is crystal clear. 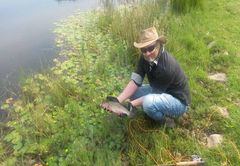 Rainbow, golden and brown trout are stocked. 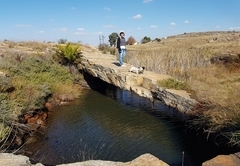 The self-catering cottage is on the doorstep of Golden Pond - a 1ha dam. It is a wooden cottage, set in a pretty private garden not too far from the main farmhouse. 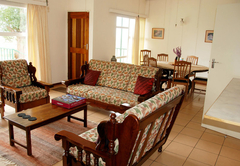 It is a double-storyed cottage with a large bedroom and en-suite bathroom downstairs. Also downstairs is a kitchen with dining area and a veranda overlooking the dam. Under the large willow tree are chairs and table. There is a mobile braai. Upstairs is a large lounge with balcony. There are two additional beds in the lounge providing in all accommodation for a family of four. There is no open fireplace but heaters are provided in all rooms. There are electric blankets on all beds. Balbeggie Lodge is a self-catering electric appliance lodge sleeping six people in three rooms with a sleeper couch for additional children's beds. 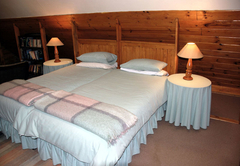 The lodge has three bedrooms with electric blankets on all beds. There are also three bathrooms, two with baths and showers and the third with only a shower. There are open fireplaces in the main bedroom as well as the lounge. Balbeggie Lodge is nestled in a grove of trees overlooking Loch Logan, a three hectare dam, which is the largest of the 11 dams on the farm. Ceilidh Cottage is a self-catering cottage with all appliances being gas or solar powered. Ceilidh Cottage sleeps eight people in three rooms. Two rooms have twin beds and the third has two sets of bunk beds. There are two bathrooms and a fully fitted kitchen. The cottage is situated at the far end of the farm with the balcony, lounge, dining room and two bedrooms overlooking Stephens Reach dam. 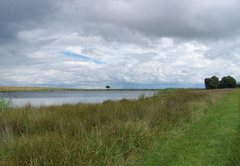 Picnic Pool, which is the last of the dams in the Little Troutbeck water course, lies a short walk downstream. 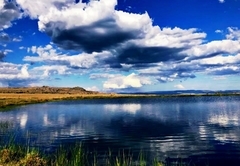 Fishing is barbless, fly-fishing only. Catch and release permitted. 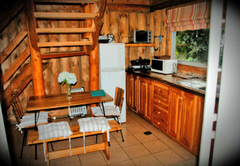 Golden Pond - Sleeps up to 4 people. 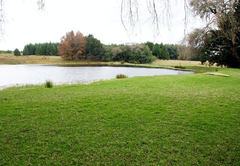 This self-catering cottage, with electricity, is on the doorstep of Golden Pond - a 1 Ha dam. It is a wooden cottage, set in a pretty private garden - not too far from the main farmhouse. The cottage is double-story, with a large bedroom (en-suite) downstairs. Also downstairs is a kitchen (2 plate counter top stove & small counter top oven); with dining area and a veranda overlooking the dam. Upstairs is a large lounge with balcony. 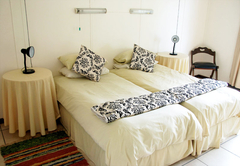 There are two additional beds in the lounge providing in all accommodation for a family of four. Under the large willow tree are chairs and table. There is a mobile braai. There is no open fireplace but heaters are provided in all rooms. There are electric blankets on all beds. 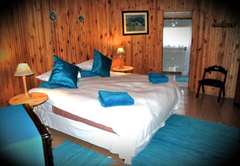 Balbeggie Lodge - Sleeps up to 6 people. Balbeggie Lodge is a private, self-catering cottage with Electricity. This cottage sleeps six people in three bedrooms with a sleeper couch for additional children's beds. There are three bathrooms, two with baths and showers and the third with a shower. There are open fireplaces in the main bedroom as well as the lounge. Balbeggie Lodge is nestled in a grove of tree's, overlooking Loch Logan. Ceilidh Cottage - Sleeps up to 8 people. Completely private, self-catering cottage with all appliances being gas or solar powered. Sleeps eight people in three rooms. Two rooms have twin beds and the third has two sets of bunk beds. There are two bathrooms and a fully fitted kitchen. The cottage is situated at the far end of the farm with the balcony, lounge, dining room and two bedrooms overlooking Stephens Reach dam. 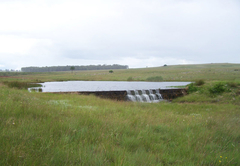 Picnic Pool, which is the last of the dams in the Little Troutbeck water course, lies a short walk downstream.